Ira Wadsworth was baptised in 1757. He was the son of Deacon Peleg Wadsworth and Lusanna Sampson. Ira Wadsworth married Sarah Freeman in 1783. Ira Wadsworth died on 28 December 1826. Ira Wadsworth was born on 26 October 1789 in Cambridgeport. He was the son of Ira Wadsworth and Sarah Freeman. Jeptha Wadsworth was born on 5 April 1745. He was the son of Deacon Peleg Wadsworth and Lusanna Sampson. Jeptha Wadsworth died on 2 May 1745. Joseph Wadsworth was born say 1634.1 He was the son of Christopher Wadsworth and Grace (Unknown). Joseph F. Wadsworth was born on 12 November 1792. He was the son of Ira Wadsworth and Sarah Freeman. Lucy Wadsworth was the daughter of Deacon Peleg Wadsworth and Lusanna Sampson. Capt. Samuel Wadsworth was born say 1636 (or 1631. )1,2 He was the son of Christopher Wadsworth and Grace (Unknown). Capt. Samuel Wadsworth died on 18 April 1676 in Sudbury killed in an ambush three miles from the town. [S83] NEHGR, Vol. 95 p. 78. Sarah Wadsworth was born on 29 June 1784. She was the daughter of Ira Wadsworth and Sarah Freeman. Uriah Wadsworth was born on 13 March 1751. He was the son of Deacon Peleg Wadsworth and Lusanna Sampson. Uriah Wadsworth married Eunice Bradford in 1789. Wealthea Wadsworth was baptised in 1759. She was the daughter of Deacon Peleg Wadsworth and Lusanna Sampson. Wealthea Wadsworth married Major (?) Alden in 1780. Zilpah Wadsworth was born on 8 April 1746. He was the son of Deacon Peleg Wadsworth and Lusanna Sampson. Zilpah Wadsworth married Perez Drew on 6 February 1772. Zilpha Wadsworth was born on 21 June 1742. He was the son of Deacon Peleg Wadsworth and Lusanna Sampson. 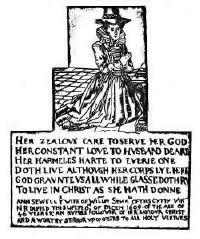 Zilpha Wadsworth died on 23 March 1744 at the age of 1. 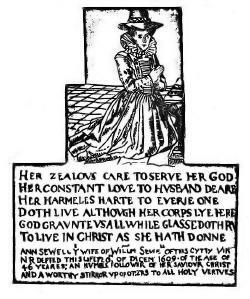 Anne Wagstaffe was baptised on 30 January 1564 at Stratford-upon-Avon, Warwickshire.1 She was the daughter of Henry Wagstaffe.1 Anne Wagstaffe married William Sewall, son of William Sewall and Matilda Horne, on 12 June 1581 in Harbury, Warwickshire.2 Anne Wagstaffe died on 20 December 1609 in Coventry at the age of 45.3 She was buried in St. Michael's Church, Coventry. Doth live, although her corps lye here. to live in Christ as she has done."